I’ve been fascinated with this “fast food,” with origins in Quebec, Canada for a while, and I’ve never even had it! I knew it had a “French fries” base, and it’s topped with “cheese curds,” and then topped with meat gravy, and it just sounded SO good. Since I’m not into cheese, or meat gravy, anymore, I was going to try and figure out how to make it with Mushroom Gravy. You know, the delicious Mushroom Gravy recipe also listed on this website, but I haven’t made it since the holidays. Somehow, things suddenly came together one night when I decided to make Tofu Fries, and this version was born. NEXT time, though, I’m going to try it with regular fries and that delicious mushroom gravy! 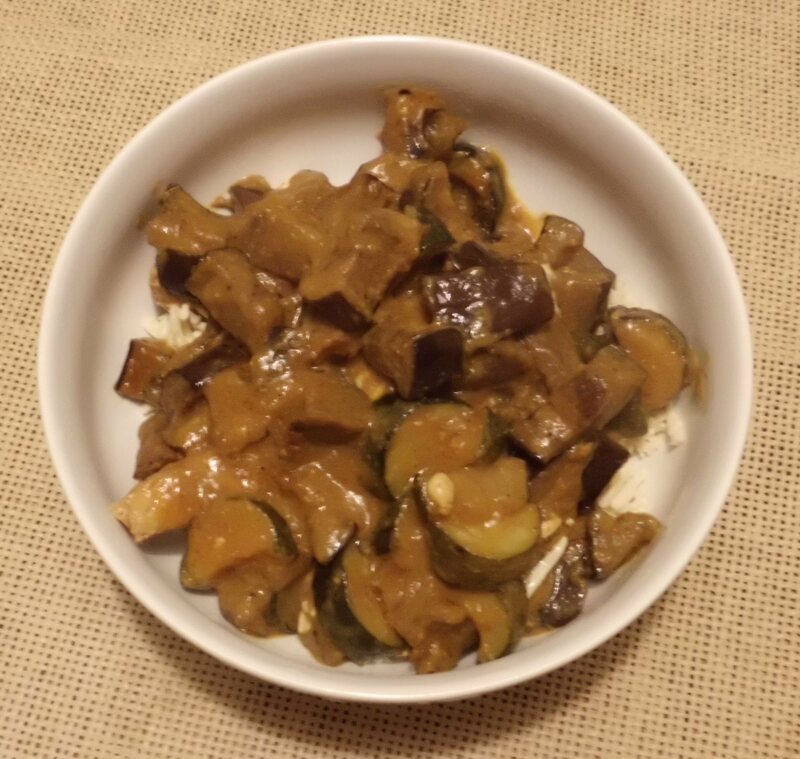 Tofu Fries for the base, non-dairy shredded mozzarella for “cheese curds,” and Zucchini Korma gravy….. Mmmmm! This is so simple. Make the Tofu Fries according to the recipe on this website. They take a little while to bake, so start getting them ready first. 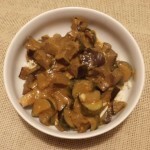 Sautee sliced onion and zucchini together, and add Korma Sauce. I keep Tasty Bite Korma and Tikka Masala cooking sauces on hand (reviews on this website) for times like this when I want to make up a quick veg sauce. I added a little extra coconut powder and Sriracha, to make it a little more coconut-y and spicier. You can add whatever you like to suit your own taste. When the fries are done, pile them on a plate or in a bowl, add a layer of non-dairy shredded mozzarella, and top with the Zucchini Korma sauce.